The only time I ever thought I knew all there was to beekeeping was the first year I kept them. Every year since I’ve known less and less. We are pleased to welcome new supporter Philip Pattison. On Saturday, 12th May 2018, the Duke’s Theatre is staging two performances of “Me and My Bee”. Our fuzzy little friends need our help so we’re launching a political party disguised as a party party, disguised as show. We invite you to help us save the world – one bee at a time! This is a new comedy for children and adults alike. Plant the seed of change, join the Bee Party before it’s too late! We have been invited to put on a display in the foyer and be around to answer questions. More details later but volunteers will be needed. The winter has been remarkably mild so far which means that rather than clustering the bees in many colonies have been quite active, producing some brood and consuming lots of stores! It is worth checking that your bees are well stocked and if not, giving them some fondant. Our next Club meeting will be on Wednesday, 24th January 2018 at The Scarthwaite Hotel, Crook O’ Lune starting at 7-30pm. 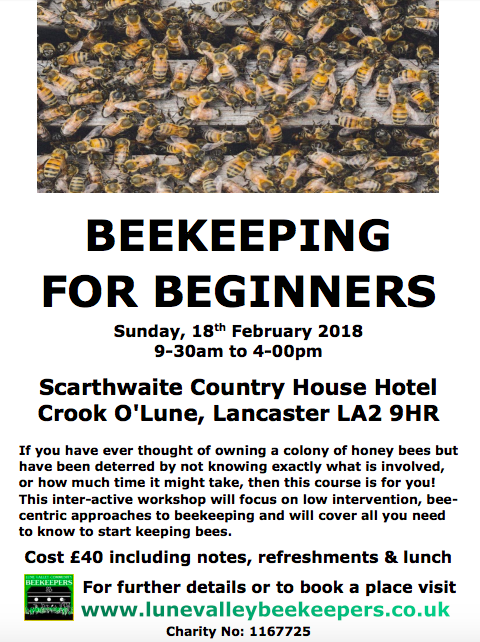 The focus will be on swarming.No matter what style of beekeeper you are, it is essential that you fully understand the swarming process, have at least one effective strategy for coping with it, and know how to deal with matters when your strategy goes wrong! We shall start by considering the factors and triggers leading up to swarming and the swarming process itself. We shall then consider various alternative and conventional strategies for responsibly managing swarming. Finally, we shall look at methods of collecting and re-housing the swam that got away! 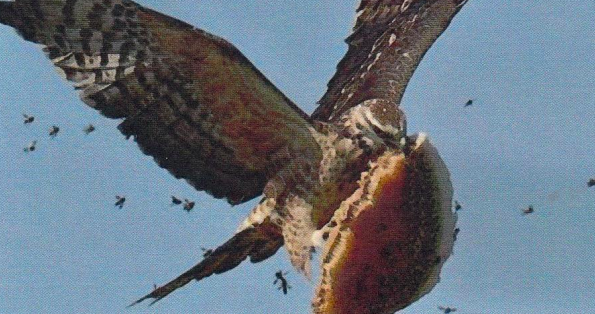 So that why they call them Honey Buzzards! The Honey Buzzard is a rare summer visitor to mature upland coniferous plantations. This year there were 41 known breeding pairs and numbers are increasing. They feed largely on the larvae of bees and wasps. Planters, 4 acres of grass land has been transformed into a large wildflower meadow. 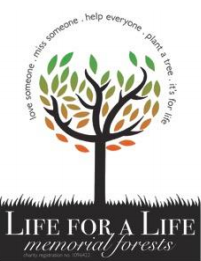 The project started 4 years ago with the grass being cut and collected using a large tractor and a combine harvester rather than just cut and dropped. This year now that the nutrient levels have been lowered by the new cutting regime, the area was chain harrowed in readiness for 20 volunteers to begin sowing wildflower seed ready for spring 2018. Ian Molyneux, the Northern Regional Bee Inspector since 2002, is to retire in April 2018 due to ill health. Ian has been highly supportive of local beekeepers in the North West during his term of office and we wish him well in his retirement. European Foulbrood (EFB) in Cheshire. All were destroyed. 13,924 queens were imported into the North West from Europe and a further 525 from Argentina. 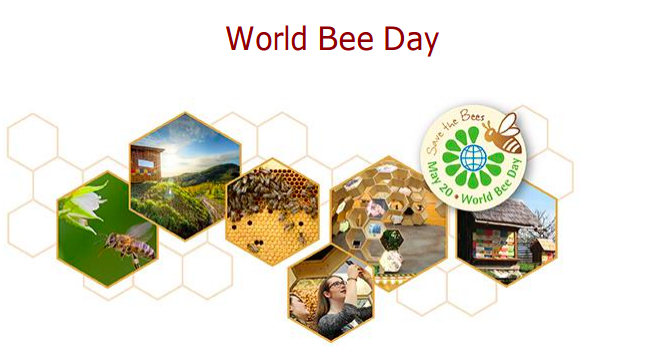 1,776 packages of bees were imported into our Region, of which 1,310 came from Italy. 19 nucs were imported from Europe but no full colonies. There have been no sightings of either the Asian hornet or Small hive Beetle in the Region, although nesting Asian hornets were found in Devon, Gloucestershire and the Channel Isles and a lone flying Asian hornet in Glasgow. 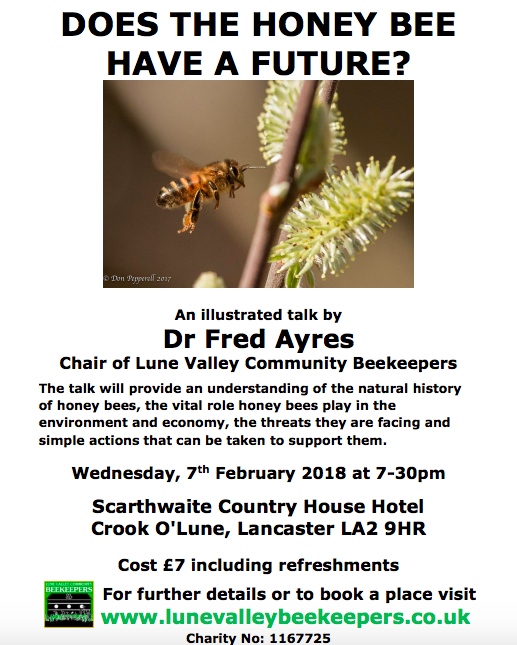 An illustrated talk by Dr Fred Ayres, Chair of Lune Valley Community Beekeepers.The talk will provide an understanding of the natural history of honey bees, the vital role honey bees play in the environment and economy, the threats they are facing and simple actions that can be taken to support them. This is a Club and Open meeting. The first part of the meeting will focus on the various sources of bees and the advantages, disadvantages and potential risks associated with each source. The second part will focus on the various approaches for getting bees out of the boxes they come in and into, and keeping them in, the hives we want them to occupy! There are no charges for members attending any Club or Open meeting, although a small contribution of £2 per person towards refreshments is expected. The 2018 summer season programme will appear in the next Newsletter. A resolution declaring May 20th as World Bee Day was adopted at the plenary session of the United Nations General Assembly on 20th December, 2017. On 17th November, 2017 the resolution was unanimously adopted at the Economic and Financial Committee of the United Nations General Assembly, with co-sponsorship of 115 countries, including the USA, Canada, China, Russian Federation, India, Brazil, Argentina, Australia, as well as all Member States of the European Union. Bees and other pollinators are extremely important when it comes to ensuring the global safety of the food supply chain. Every third spoonful of food depends on pollination. By pollinating crops, bees also provide a significant source of jobs and income for farmers, which is particularly important for developing countries. An international study of IPBES estimates that the annual global food production which depends on pollination is worth between USD $235 and $577 billion. In addition, bees also have an important role in nature conservation. Studies of UN Agencies and the International Union for Conservation of Nature show that bee populations and the populations of other pollinators have significantly decreased, making them more and more endangered. Therefore, the Republic of Slovenia, on the initiative of the Slovenian Beekeepers’ Association, initiated procedures in the Food and Agriculture Organization of the United Nations in 2015 to declare World Bee Day, and proposed a resolution which would emphasise the importance of bees and other pollinators. We look forward to seeing this resolution adopted. Left and right handed bees! When presented with a barrier that bees could only cross by flying through a gap on either side, scientists from the University of Queensland have shown that, with gaps of equal size, 45% of bees tended to steer through one side rather than the other, while 55% would use either side. If one gap was wider than the other, the bees preferred that one. However, if the right-hand gap was wider, bees with a preference for steering left took longer to decide to use the wider gap than those with a right handed bias. Apis mellifera mellifera It is fairly certain that the Dark European Honey Bee, Apis mellifera mellifera, has been native to mainland Britain since before the closing of the Channel Landbridge, when sea levels rose following the last Ice Age. They became isolated and adapted to the different conditions they found themselves in. A m m are native to the whole of Northern Europe north of the Alps from the Atlantic to the Urals, where they evolved in isolation, having been cut off by such natural barriers as mountains, water and ice. In 1902, some beekeepers in the Isle of Wight started to report colony losses due to a mysterious illness which came to be known as Isle of Wight disease. According to contemporary accounts, not all of which are reliable or without vested interest, for the next 20 years this disease spread through the whole of the UK decimating colonies and leading such a notable beekeeper as Brother Adam to declare that Dark European Honey Bee was virtually extinct in the British Isles. In order to replenish the Nation’s honey bee stocks large numbers of colonies were imported. These were largely but not exclusively, A m carnica, the Carniolan honey bee which is native to Slovenia, southern Austria, and parts of Croatia, Bosnia and Herzegovina, Serbia, Hungary, Romania, and Bulgaria, and A m lingustica, the Italian honey bee, which is native to the Italian peninsula. By the 1950s it was generally thought that almost all the honey bees in the UK were hybrids of the various imported species.Those supporting the importation of foreign bees at the time seem to have gone out of their way to promote the idea that dark bees were bad tempered and not very productive whilst Brother Adam was promoting the virtues of his Buckfast strain, which he based on imported species.From the late 1960s onwards, various initiatives have been launched to re-establish the Dark Bee, but obtaining pure or fairly pure stocks to breed from has proved difficult and wing morphology, a means of identifying Dark Bee characteristics, has proved to be unreliable. However, DNA analyses of honey bees in mainland Britain are showing that in areas without imports of bees, 50% of the bees genes are from the native species. This is probably not too surprising as native drones will fly and mate in cooler and less clement weather so that, over time, there is a strong natural selection towards the native bee. Also, native type bees are well adapted for survival in our conditions so natural selection will favour their dominance. So, if we stop importing bees, in time, we may get back to something like the lost Dark Bee. As a Club we do not advocate the use of chemicals to treat bees. 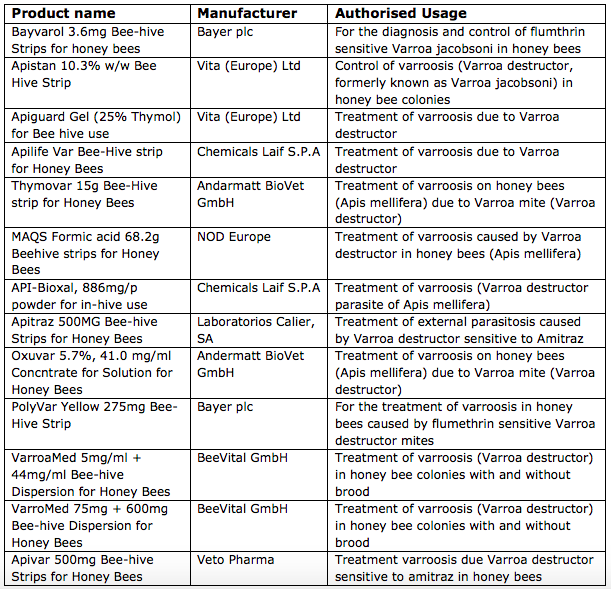 For those who wish to do so, the following table shows the only current bee medicines authorised by the Veterinary Medicines Directorate for the treatment of bees in the UK. If you do treat your bees, you are legally required to record all hive treatments including when and where purchased, type and amount of treatment or product used, batch number and expiry date if applicable, when applied and when withdrawn.